Amazon Price: $51.23 $51.23 (as of February 13, 2019 12:09 am – Details). Product prices and availability are accurate as of the date/time indicated and are subject to change. Any price and availability information displayed on the Amazon site at the time of purchase will apply to the purchase of this product. 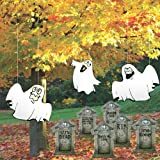 This Halloween yard decoration "Ghosts in the Graveyard" is cut from our white corrugated plastic. Tombstones and Ghosts are printed with our state of the art full color printer. Set includes: 30" x 20" Tombstones (3), 42" x 33" Scary Ghost (1), 32" x 26" Happy Ghost (1), and 41" x 35" Laughing Ghost (1). Each ghost has 2 holes for hanging. (Hanging material NOT included). Each tombstone comes with 2 wire stakes with a total of 12 stakes in set.